Do the Chinese Infants (and their parents) have any right, at least, in China? The moderators correctly identified nature of the Finnish massacre! The shooter was a woman-hater. Eight women and two men were massacred, a 9th woman is seriously injured. Gunman dead. The gunman was identified as Matti Juhani Saari, a 22-year-old student at the Kauhajoki School of Hospitality. Saari entered a classroom and fired at students taking an exam killing 10. He then threw firebombs at his victims burning their bodies beyond recognition. At least two other people were wounded. Finland’s second school shooting in 10 months leaves 9 dead. A Finnish student shot dead nine others at a vocational school in western Finland Tuesday before shooting himself. “A cold-blooded shooter entered the building with an automatic pistol and started cutting down students,” said a maintenance worker at the “Kauhajoki School of Hospitality (! )” in the town of Kauhajoki. The shooting followed another school killing in Finland at Jokela high school in November 2007, where Pekka-Eric Auvinen killed six fellow students, the school nurse and the principal. Anti-Internal Security Act (ISA) activists show their bald heads after shaving to show their support for those detained under ISA in Kuala Lumpur September 21, 2008. The government came under intense pressure after the police arrested a blogger, a journalist and an opposition MP under the draconian Internal Security Act (ISA) that allows indefinite detention without trial. REUTERS/Zainal Abd Halim. Image may be subject to copyright! 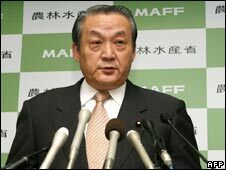 Japan’s farm minister, Seiichi Ota, has tendered his resignation because of a food scandal involving tainted rice. Mr Ota’s ministry has admitted it was told in January 2007 that a food company was distributing rice tainted with pesticide. Mr Ota had earlier said he saw no need to make “too much of a fuss over it”. It has since emerged that the rice, destined for industrial uses, was resold as a food product and served to the elderly. 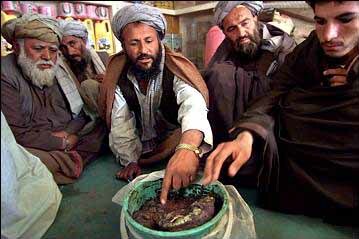 The rice has been found to be tainted with pesticides and mould, and was known to be unfit for human consumption. No-one has been reported as ill as a result of eating the rice; a government official said this was because the density of contaminants was low. “I met Prime Minister [Yasuo] Fukuda and told him my decision to resign, considering the seriousness of the tainted rice problem for the society,” Mr Ota said. Japanese broadcaster NHK said his resignation had been accepted. Japan faces general elections soon, possibly as early as next month. As information trickled out, it became clear that the bad rice was sold to more than 300 firms, including brewers, food ingredient wholesalers and sweet makers. 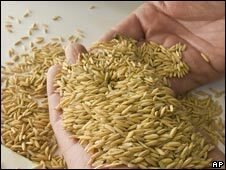 A government report released this week showed that the rice was imported from China, Vietnam and elsewhere, and intended for use in the making of glue and other industrial products. Instead, the Osaka-based Mikasa Foods company sold the rice on to firms which used it for making foods that have been distributed to hospitals and care homes. Young people have also been affected as the bad rice was used in making some snacks sold in convenience stores, and in school lunches. Japanese media reported that police said on Wednesday that the president of one of the small companies that had bought the rice from Mikasa Foods, had committed suicide by hanging himself. When Mr Ota’s ministry first heard of the tainted rice entering the food chain, he said it was unable to uncover any wrongdoing. Mr Ota only took over the portfolio in August this year. The BBC’s Chris Hogg in Tokyo says the minister has come under fire after admitting his ministry “overlooked” the illegal distribution of rice unfit for human consumption. Our correspondent says Mr Ota is known for his slips of the tongue, such as his expressed confidence that no-one would die from eating tainted rice and that no fuss was necessary. The senior bureaucrat at the agriculture ministry had already resigned. Copyright BBC. See Fair Use Notice! Tian Wenhua, the board chairwoman and general manager of China dairy giant Sanlu Group, is fired. Now it’s time to claim substantial damages from Fonterra. The sacking of Tian Wenhua, the board chairwoman and general manager of China dairy giant Sanlu Group, is of course a good move. But both she and the directors from Fonterra should be prosecuted and punished to the maximum extent of the law. The Chinese parents owe this to their babies. “She was also removed from her post as the secretary of the corporation committee of the Communist Party of China (CPC), according to Party authorities of Hebei Province an Shijiazhuang City.” Xianhu reported. This move is of course a damage control measure, aimed to make the rest of the CPC look good. What are the roles of Hu Jin-tao, Wen Jia-bao and Jiang Mianheng in the milk powder scandal? SHIJIAZHUANG, Sept. 16 (Xinhua) — Four local officials in north China’s Hebei Province were fired on Tuesday following the baby milk powder scandal across the country. Zhang Fawang, vice mayor in charge of agricultural production of Hebei provincial capital Shijiazhuang, and Sun Renhu, the city’s animal husbandry administration chief, were fired late Tuesday following legal procedures, according to a decision made by the city’s legislative body. Shijiazhuang Food and Drug Administration Bureau director ZhangYi and the city’s Quality and Technical Inspection Bureau chief LiZhiguo were also dismissed from their posts for loose supervision on the milk suppliers. Tian Wenhua, the board chairwoman and general manager of Shijiazhuang-based dairy giant Sanlu Group, was also fired from her posts. She was also removed from her post as the secretary of the corporation committee of the Communist Party of China (CPC), according to Party authorities of Hebei Province an Shijiazhuang City. An estimated 1,253 infants, including two fatally, across the country developed kidney stones after drinking Sanlu’s baby formula tainted by melamine, a chemical believed to help increase the protein content in the milk. However, the contamination has spread to other dairy companies as the country’s top quality watchdog said Tuesday they found the chemical melamine in 69 batches of baby milk powder produced by 22companies nationwide. The authorities ordered a halt to the sale of the tainted products which included such well-known brands as Mengniu, Yili and Yashili, among others. Gao Qiang, the Communist Party chief of the Ministry of Health, visited baby patients in Hebei on Tuesday. The province alone has reported a total of 861 infants suffering urinary system stones, with 61 of them hospitalized. Gao, also head of the emergency team for handling Sanlu tainted milk, ordered timely and effective diagnosis and treatment for infants sickened by the contaminated milk. Experts should be organized to go to remote rural areas to check the sick infants and urge them to be sent to hospitals for diagnosis and treatment, he said while visiting sick babies and medical staff in Hebei People’s Hospital and Hebei Children’s Hospital. According to the ministry, the two deaths occurred both in the northwest Gansu Province. They were a five-month-old boy who died on May 1 after his family refused further treatment and an eight-month-old girl whose family also refused an operation and removed her from hospital on July 22 on which day she died. Both of the two were bred with the Sanlu formula and suffered kidney failure. Zhang Zhenling, Sanlu’s vice president, apologized to the public on Monday. “The serious safety accident of the Sanlu formula milk powder for infants has caused severe harm to many sickened babies and their families. We feel really sad about this,” he said while reading a letter of apology to reporters. Among the arrested were two brothers surnamed Geng in Zhengding County, Hebei. They told police that they had been selling three tons of contaminated milk per day since the end of last year. COPYRIGHT the author or Xinhua News Agency. 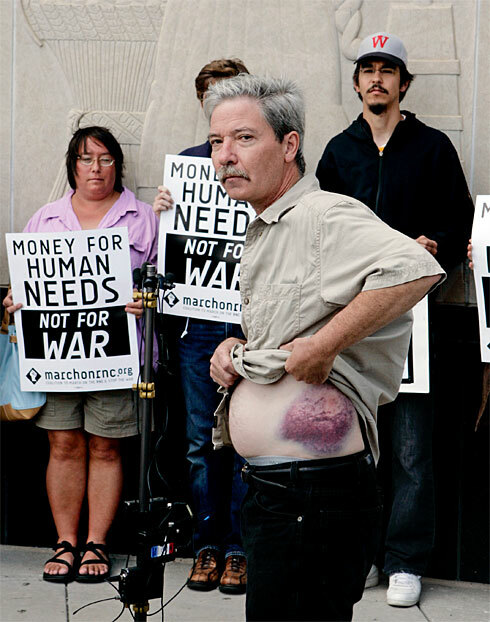 Mick Kelly shows off a bruise at a news conference, Friday, in St. Paul, that he said he received after getting hit by a projectile fired by riot police on anti-war protesters Thursday night. Photo: Jim Mone, AP. Image may be subject to copyright. 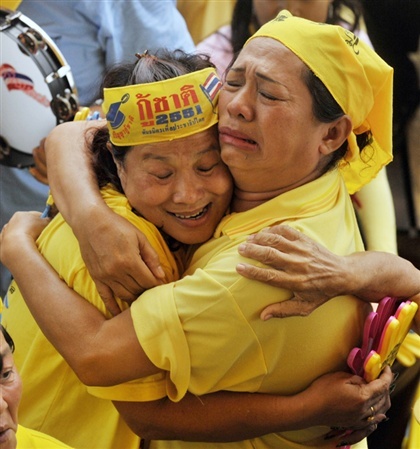 Anti-government demonstrators celebrate a court ruling ordering Thailand’s Prime Minister Samak Sundaravej to stand down, at the Government House in Bangkok September 9, 2008. Protesters occupying Thailand’s Government House to force the resignation of Samak vowed on Tuesday to continue their sit-in despite the court verdict against Samak. REUTERS/Adrees Latif. Image of the Day: The Unreality! 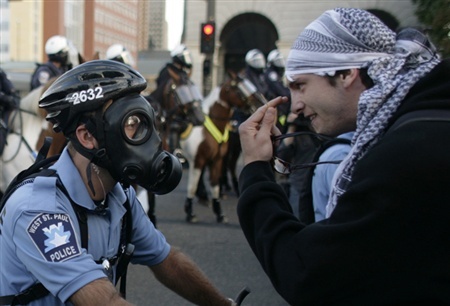 Riot police face off with demonstrators as the police block a bridge into downtown St. Paul to keep protesters from getting close to the site at the 2008 Republican National Convention in Minnesota September 4, 2008. REUTERS/Damir Sagolj – Image may be subject to copyright!